Netflix relies on licensing deals to stock its on-demand offerings -- and the cost of those deals is about to skyrocket. NEW YORK (CNNMoney) -- In the not so distant past, Netflix was known mainly for its red envelopes. The DVD-rental-by-mail service was the company's core, and streaming video was a side perk for subscribers. Fast forward to 2011, and online movies and TV couldn't be hotter. Google, Amazon, Hulu and others have jumped into the fray -- putting studios in the power position. They want to be paid more for the content they're providing. That spells trouble for Netflix's streaming content costs. "Netflix has another year or two on most of these contracts, and then the game completely changes," says Michael Pachter, analyst at Wedbush Securities. Pachter predicts Netflix's streaming content licensing costs will rise from $180 million in 2010 to a whopping $1.98 billion in 2012. When streaming video was new, Netflix was able to secure contracts with the likes of Warner Bros. Studios and MTV to license big TV and film catalogues for about $5 million to $10 million per year. This time around, Pachter says, those costs could increase more than tenfold. "The content owners realize they can't give Netflix all the leverage," he says. "Netflix had the power when they were the only bidder. But you don't have as much leverage when you suddenly have competition." 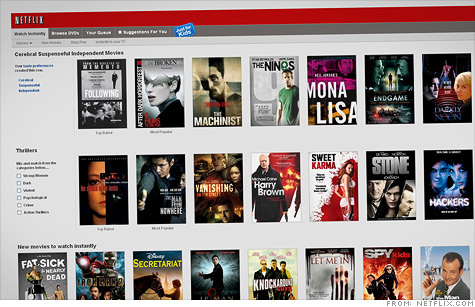 Netflix subscribers got a taste of the studios' new hardball approach last month, when hundreds of Sony (SNE) movies -- including high-profile titles like "The Social Network" and "Salt" -- abruptly vanished from Netflix's "watch now" catalog. In a blog post, Netflix pinned the blame on a "temporary contract issue" between Sony and Starz, a pay cable network that licenses Sony's movie catalog. Back in 2008, Netflix struck a four-year deal with Starz that gave it streaming access to Starz' offerings. But Starz' deal with Sony included a cap on the number of subscribers who can watch Sony movies online, a source told the LA Times. Once Netflix' audience exceeded the cap, the contract was null. Starz' catalog of Disney movies available for online streaming is on the verge of triggering a similar contractual cap, the newspaper reported. In a letter to shareholders earlier this year, Netflix called the Starz arrangement "one of our most important deals," because it's one of the few that gives Netflix access to relatively recent films. The deal runs through early 2012, but the Sony/Starz standoff could accelerate the renewal talks. "Studios are starting to put their foot down," says ThinkEquity senior analyst Atul Bagga. "They weren't paying attention to streaming at all, but now they see an opportunity to monetize. And they're going to take it." That's a big threat to Netflix. On the other hand, the company has the money and motivation to spend more to keep its rapidly growing subscriber base happy. "The cost of content is going to go up, no doubt about it," Bagga says. "It's going to come down to who has the ability and the willingness to write big checks. Netflix is probably the one to do it." Netflix (NFLX) had a $161 million profit last year on sales of $2.2 billion, and it ended last quarter with $342 million in cash on hand. But Netflix's rivals have much bigger wallets. At the end of the first quarter, Amazon (AMZN, Fortune 500) had almost $7 billion in cash, and Google (GOOG, Fortune 500) had a whopping $37 billion. In another bit of uncertainty, Netflix's most direct competitor, Hulu, is on the block. Walt Disney Co. (DIS, Fortune 500) Chief Executive Robert Iger said at a conference last week that Hulu's owners -- who include Disney -- are "committed to selling" it. The list of interested potential Hulu buyers includes Google, Microsoft (MSFT, Fortune 500), Amazon, Yahoo (YHOO, Fortune 500) and nearly every other tech giant, plus telecoms like AT&T (T, Fortune 500) and Verizon (VZ, Fortune 500). Landing Hulu would give any of them a strong beachhead for challenging Netflix. Right now, no one else has cracked the code. Netflix's global subscriber base grew almost 70% over the past year, to 23.6 million users. In contrast, Google's movie offerings on YouTube and Amazon's streaming catalog are still new and fairly paltry compared with Netflix's arsenal. "Netflix is the first and the biggest," Bagga says. "In a broad sense, the rivals aren't competing with each other. Everyone is competing with Netflix." But if this turns into a clash of titans, Netflix is still a small player battling much larger and richer giants. "Netflix is merely a conduit," Pachter says. "Of all the people who want to be in the business -- Google, Amazon -- they're smaller by far. The big boys will take share of subscribers, or bid up the cost of content. Either way, Netflix loses."